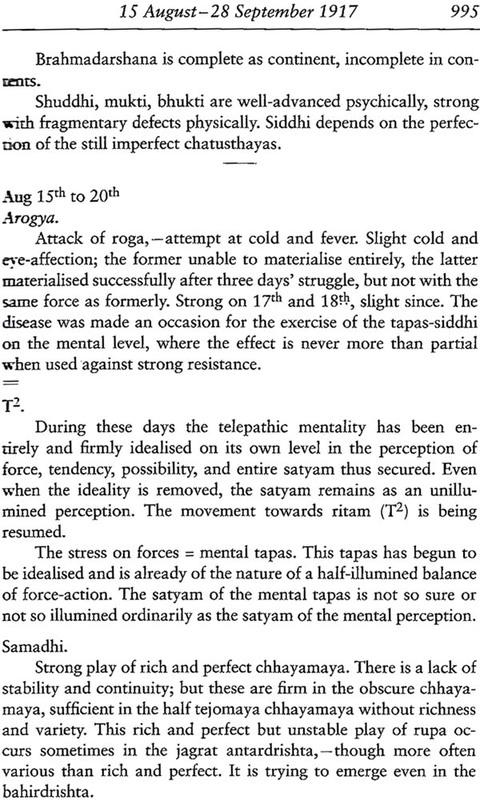 Record of Yoga is a diary of Sri Aurobindo's practice of Yoga between 1909 and 1927. "It has been seen that in repose, in nivritti[,] in udasinata, perfect peace and an and a are possible; but the thing the Yoga has set out to establish is the perfect harmony of Nivritti & Pravritti, of desirelessness & Lipsa, of Guna & Nirguna, complete Ananda, Tapas, Knowledge, Love, Power & Infinite Egoless Being, consummating in the full and vehement flow of the Pravritti. 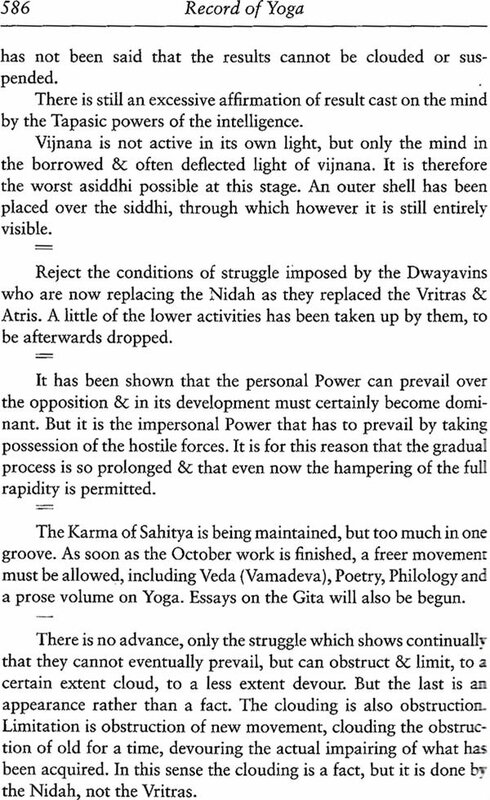 By the fulfilment or failure of this harmony the Yoga stands or falls." 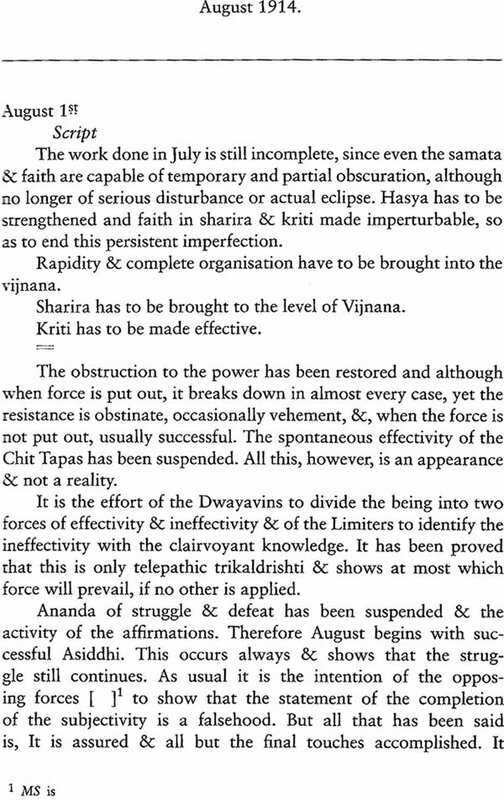 "The whole struggle in the siddhi now is between the present & the future, between the telepathic knowledge that sees & admits the present & the vijnanamaya that reaches beyond to the future, between the force that admits & manipulates present forces & the force that aims at annulling & replacing or transforming them rapidly into the image of their vijnanamaya & ananda- may a equivalents ... "
Recorded of Yoga is a diary of Sri Aurobindo ‘s yoga between 1909 and 1927. He Kept it fairly regularly from 1912 to 120 , and also wrote a few entries in 1909, 1911 and 1927. At different times he gave this diary different names . 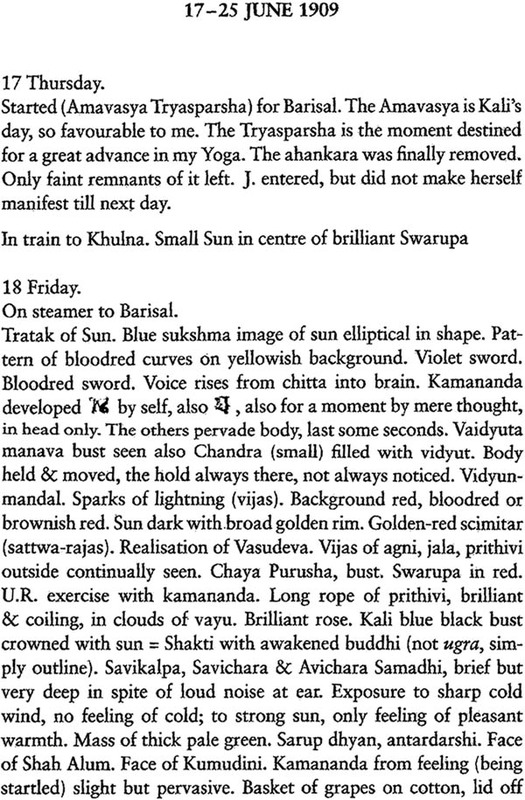 “Recorded o Yoga “ was the most typical and the editors have used it as the general title of the work. 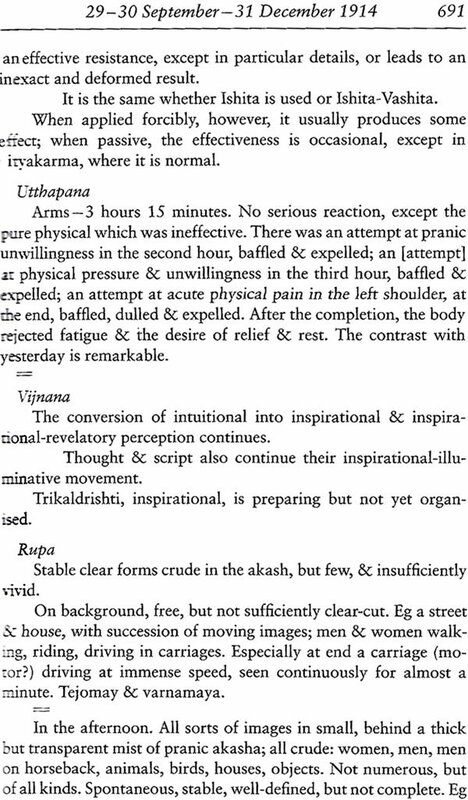 During the years he kept the Diary Sri Aurobindo also wrote other materials relating to his practice of yoga . 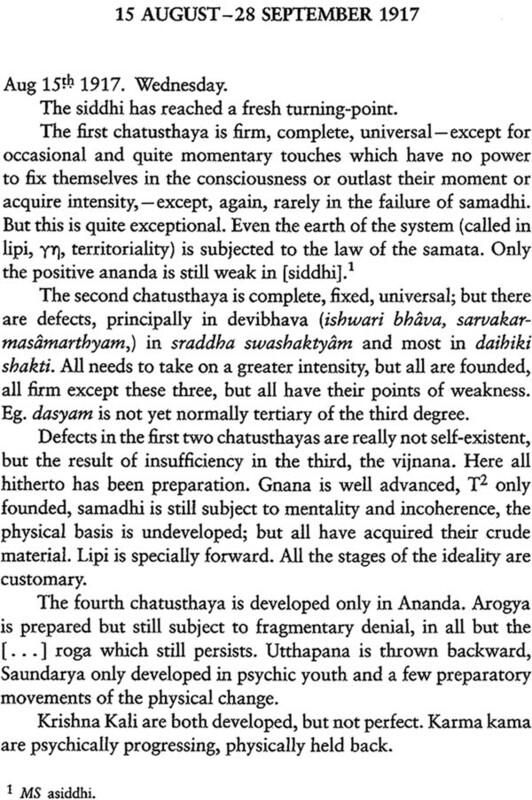 These include descriptions of the seven “chatusthayas” (groups of four elements ), which are the basis of the yoga of the Record . These materials are Appendix . 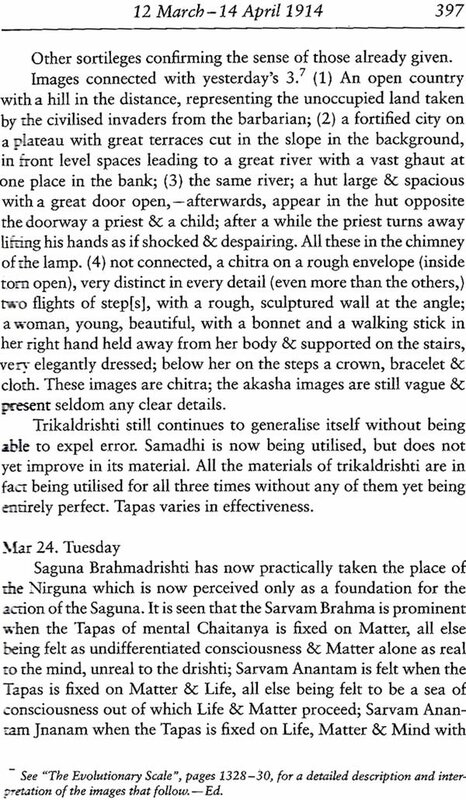 Sri Aurobindo Wrote the Dairy and related materials by hand in various notebooks and on lose sheets of paper . 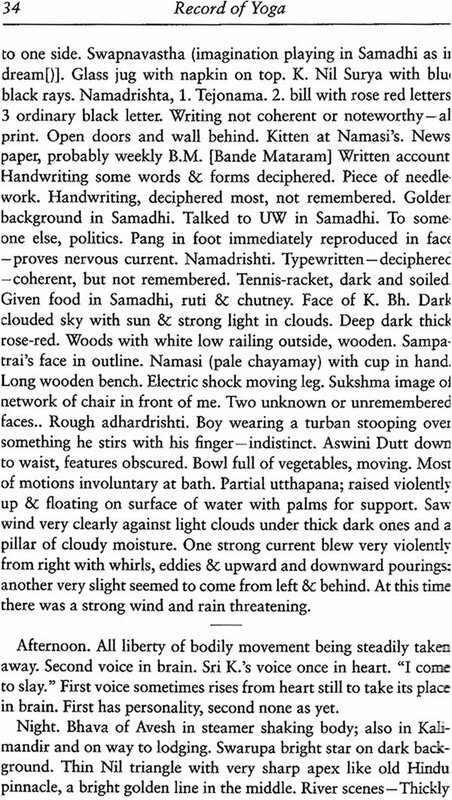 He used a special terminology which included words Sanskrit and Other languages , as well as abbreviations , symbols and marking, some of which are difficult to represents in a printed book. The special terminology is explained in a separate glossary. The editors have tried to reproduce the detail of the manuscript s as exactly as possible . 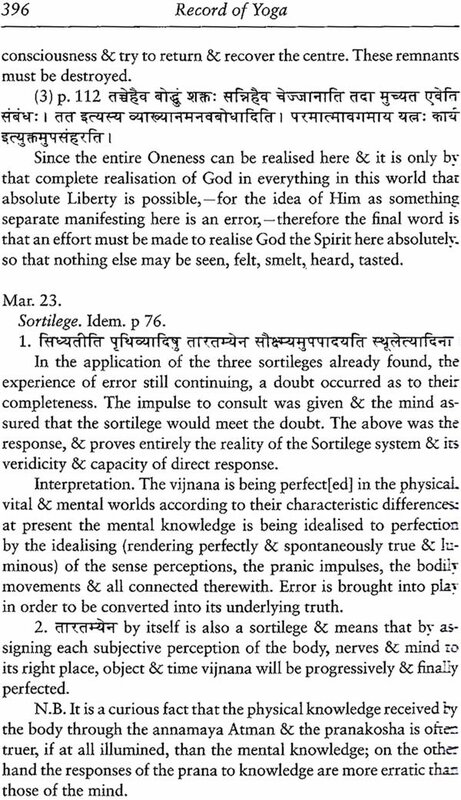 editorial problems arising from damage t the manuscripts s, illegibility, etc. are indicated by means of the system explained in the guide to Editorial Notations on the next page. The text of the diary entries and related materials , transcribed and arranged by the Editors, appears here for the first tiem as a book. समता शान्ति: सुखं हास्यमिति शान्तिचतुष्टयं ! Samata shantih sukham hasyam iti shantichatusthayam. The basis of internal peace is samata, the capacity of receiving with a calm and equal mind all the attacks and appearances of outward things, whether pleasant or unpleasant, ill-fortune and good-fortune, pleasure and pain, honour and ill-repute, praise and blame, friendship and enmity, sinner and saint, or, physically, heat and cold etc. 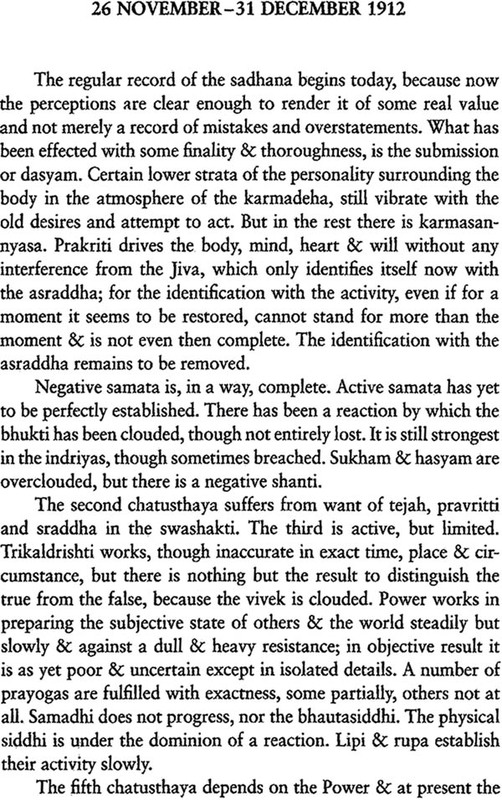 There are two forms of samata, passive and active, samata in reception of the things of the outward world and samata in reaction to them. Titiksha is the bearing firmly of all contacts pleasant or unpleasant, not being overpowered by that which is painful, not being carried away by that which is pleasant. 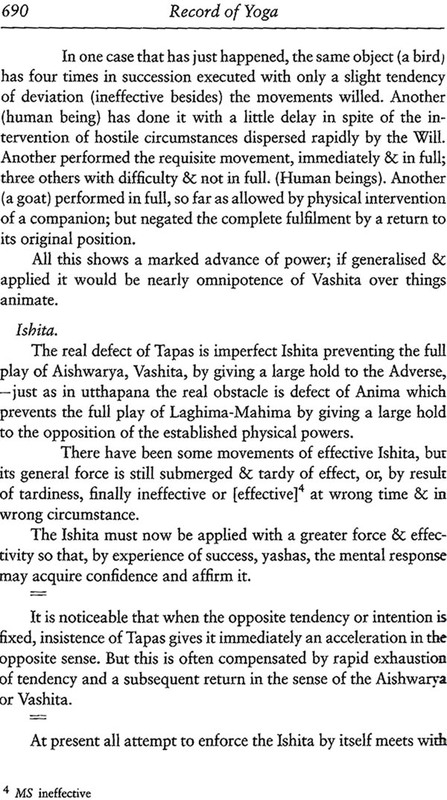 Calmly and firmly to receive both and hold and bear them as one who is stronger, greater, vaster than any attack of the world, is the attitude of titiksha. Udasinata is indifference to the dwandwas or dualities; it means literally being seated above, superior to all physical and mental touches. The udasina, free from desire, either does not feel the touch of joy & grief, pleasure and pain, liking and disliking, or he feels them as touching his mind and body, but not himself, he being different from mind and body and seated above them. Nati is the submission of the soul to the will of God; its acceptance of all touches as His touches, of all experience as His play with the soul of man. 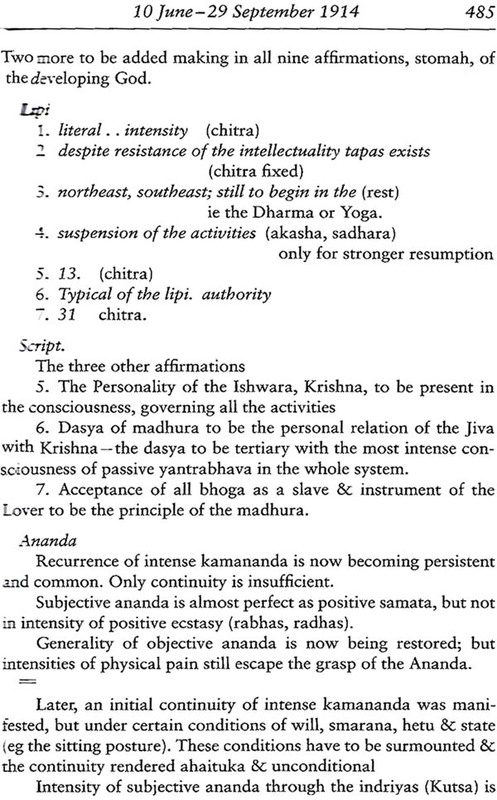 Nati may be with titiksha, feeling the sorrow but accepting it as God's will, or with udasinata, rising superior to it and regarding joy and sorrow equally as God's working in these lower instruments, or with ananda, receiving everything as the play of Krishna and therefore in itself delightful. 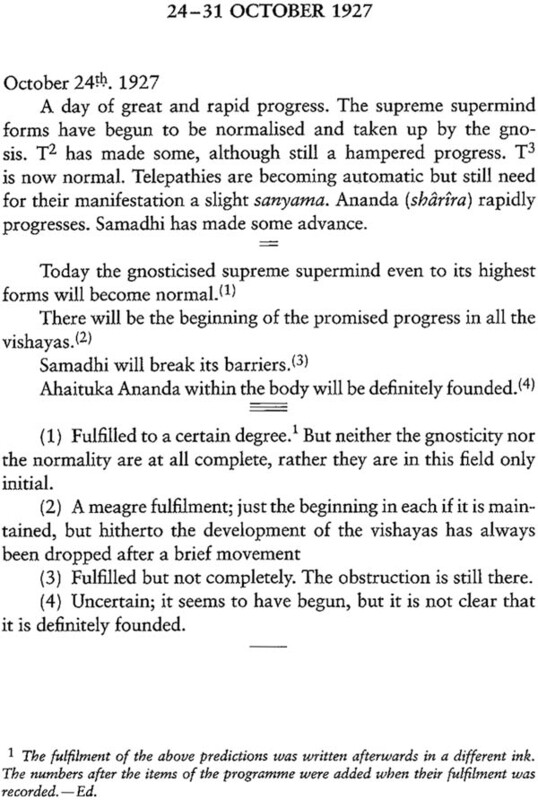 The last is the state of the complete Yogin, for by this continual joyous or anandamaya namaskara to God constantly practised we arrive eventually at the entire elimination of grief, pain etc, the entire freedom from the dwandwas, and find the Brahmananda in every smallest, most trivial, most apparently discordant detail of life & experience in this human body. 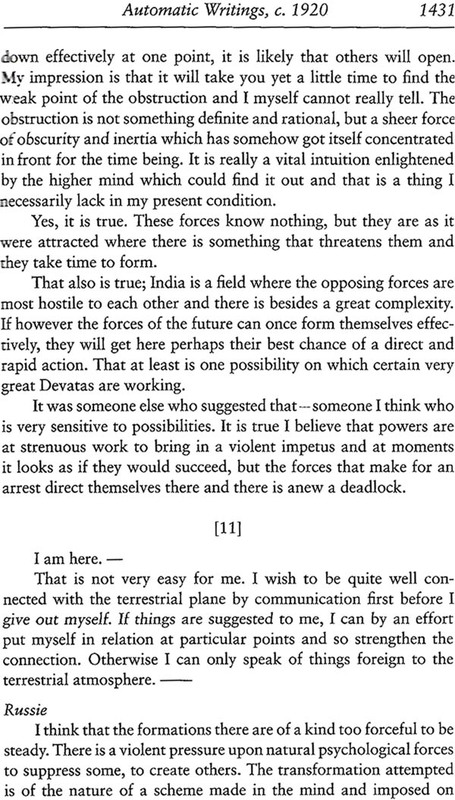 We get rid entirely of fear and suffering; Anan- dam Brahmano vidvan na bibheti kutaschana. 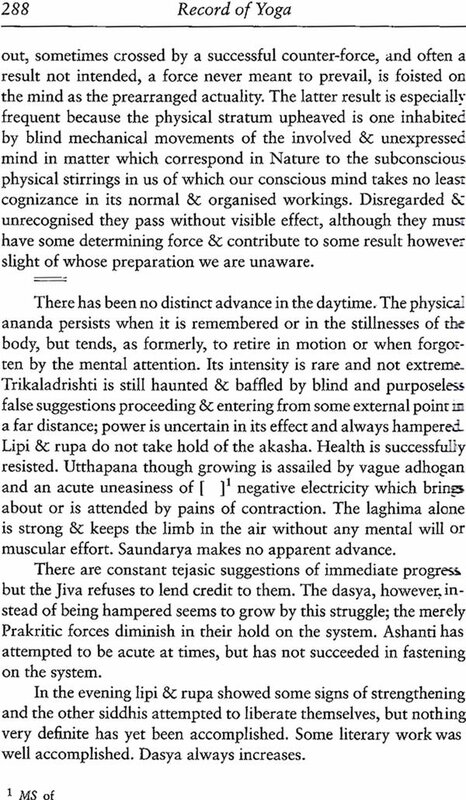 We may have to begin with titiksha and udasinata but it is in this ananda that we must consummate the siddhi of samata. The Yogin receives victory and defeat, success and ill-success, pleasure and pain, honour and disgrace with an equal, a sarna ananda, - first by buddhi-yoga, sep- arating himself from his habitual mental & nervous reactions & insisting by vichara on the true nature of the experience itself and of his own soul which is secretly anandamaya, - full of the sarna ananda in all things. 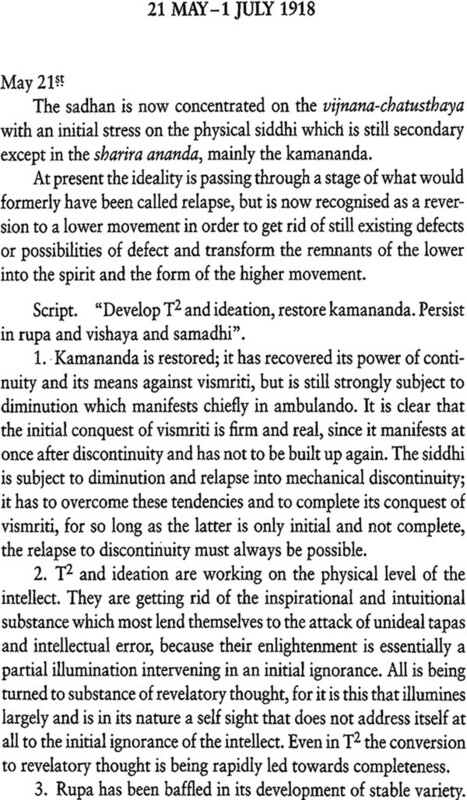 He comes to change all the ordinary values of experience; amangala reveals itself to him as mangala, defeat & ill-success as the fulfilment of God's immediate purpose and a step towards ultimate victory, grief and pain as concealed and perverse forms of pleasure. 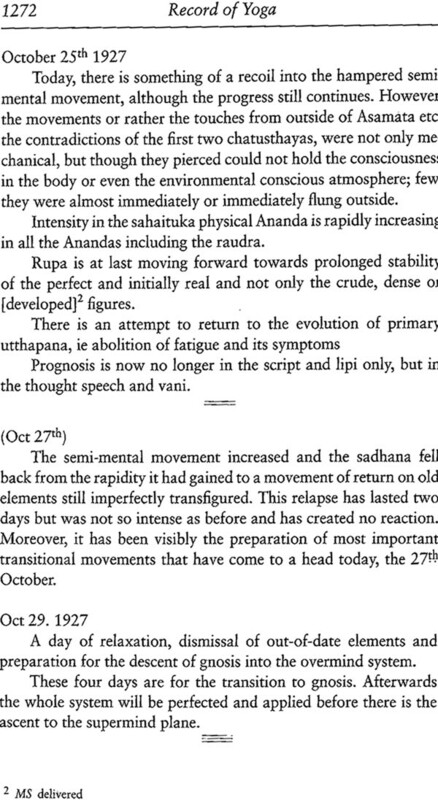 A stage arrives even, when physical pain itself, the hardest thing for material man to bear, changes its nature in experience and becomes physical ananda; but this is only at the end when this human being, imprisoned in matter, subjected to mind, emerges from his subjection, conquers his mind and delivers himself utterly in his body, realising his true anandamaya self in every part of the adhara. 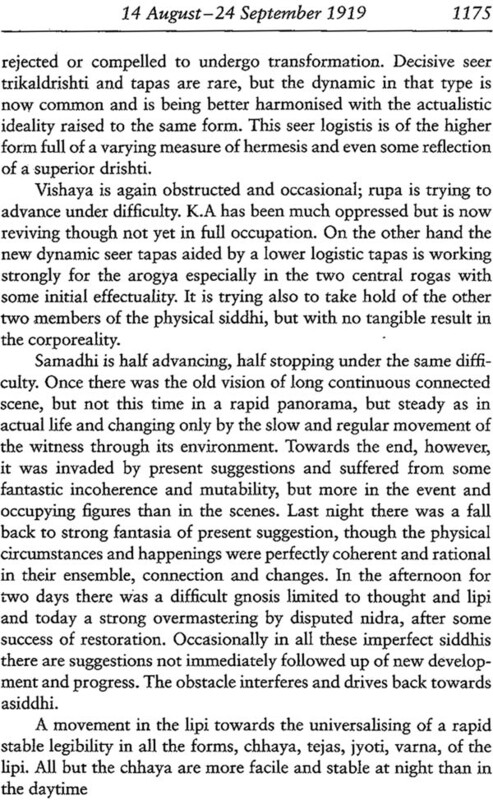 Rasa is the appreciative perception of that guna, that aswada, taste and quality which the Ishwara of the lila perceives in each different object of experience (vishaya) and for the enjoyment of which He creates it in the lila. Pritih is the pleasure of the mind in all rasa, pleasant or unpleasant, sweet or bitter. 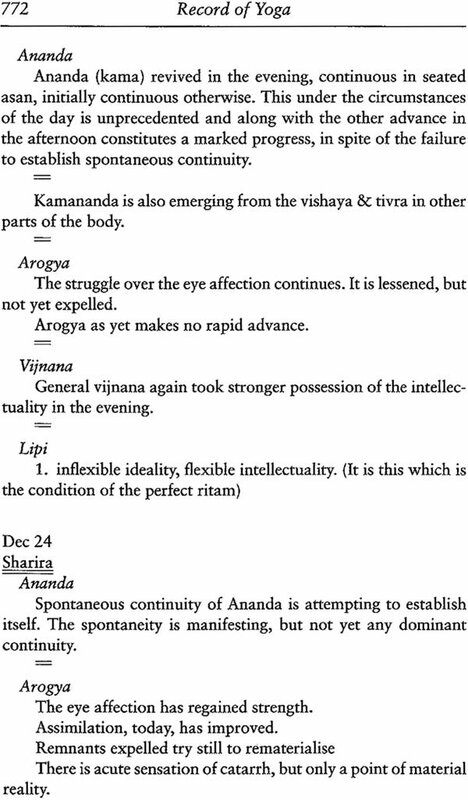 Ananda is the divine bhoga superior to all mental pleasure with which God en- joys the rasa; in ananda the opposition of the dualities entirely ceases. 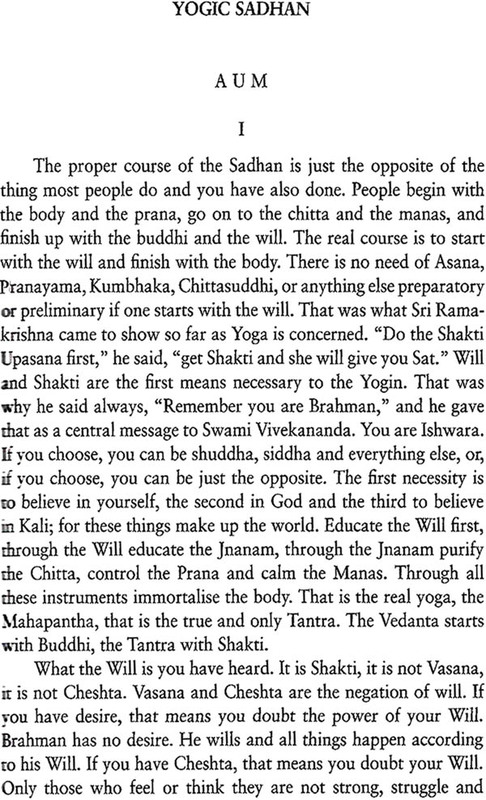 Only when samata is accomplished, can shanti be perfect in the system. If there is the least disturbance or trouble in the mentality, we may be perfectly sure that there is a disturbance or defect in the samata. 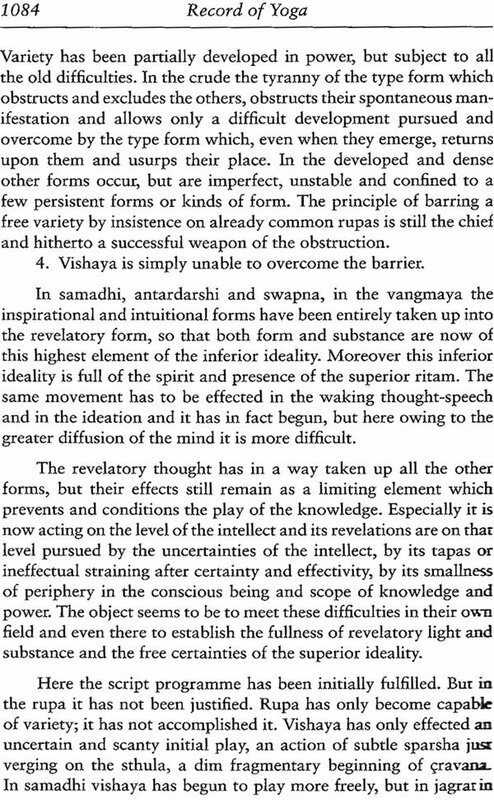 For the mind of man is complex and even when in the buddhi we have fixed ourselves entirely in udasinata or nati, there may be revolts, uneasinesses, repinings in other parts. The buddhi, the manas, the heart, the nerves (prana), the very bodily case must be subjected to the law of samata. 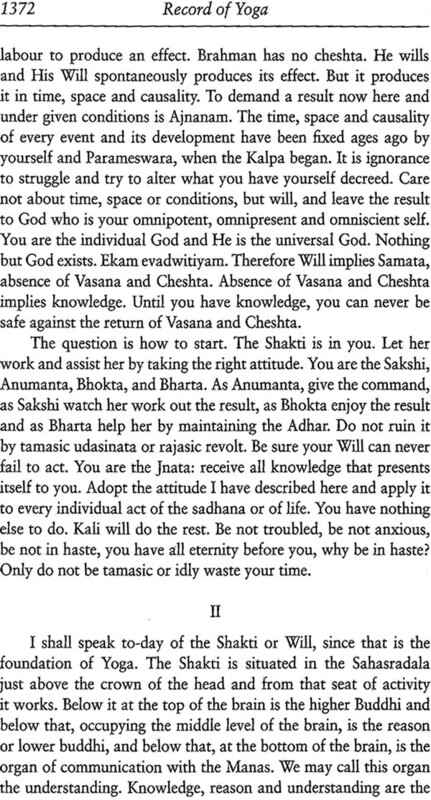 Shanti may be either a vast passive calm based on udasinata or a vast joyous calm based on nati. 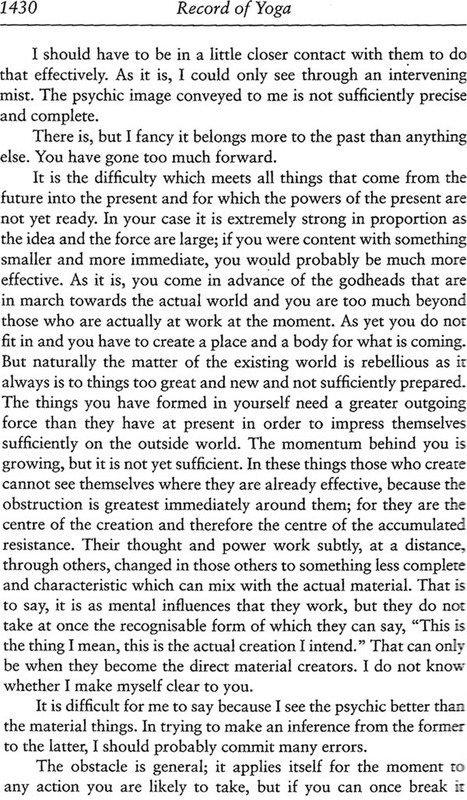 The former is apt to associate itself with a tendency to inaction and it is therefore in the latter that our Yoga must culminate. 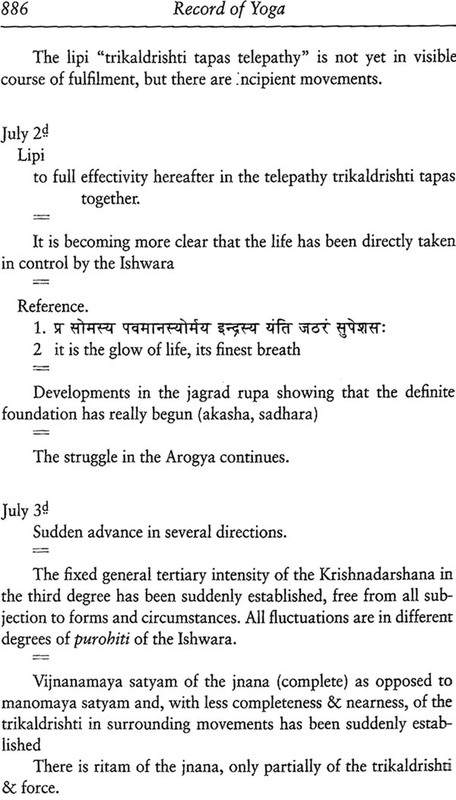 Sukham is the complete relief & release from duhkha, from vishada, which comes by the fulfilment of samata and shanti. The perfected Yogin has never in himself any touch of sorrow, any tendency of depression, cloud or internal repining and weariness, but is always full of a sattwic light and ease. 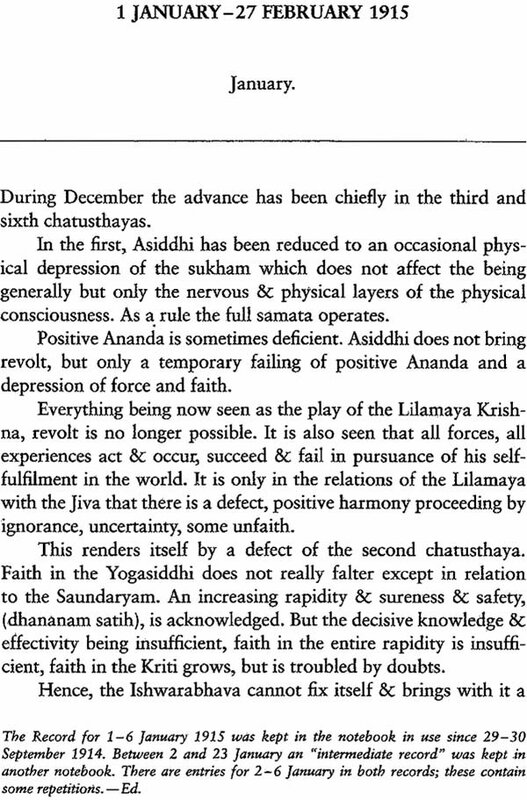 Hasyam is the active side of sukham; it consists in an active internal state of gladness and cheerfulness which no adverse experience mental or physical can trouble. 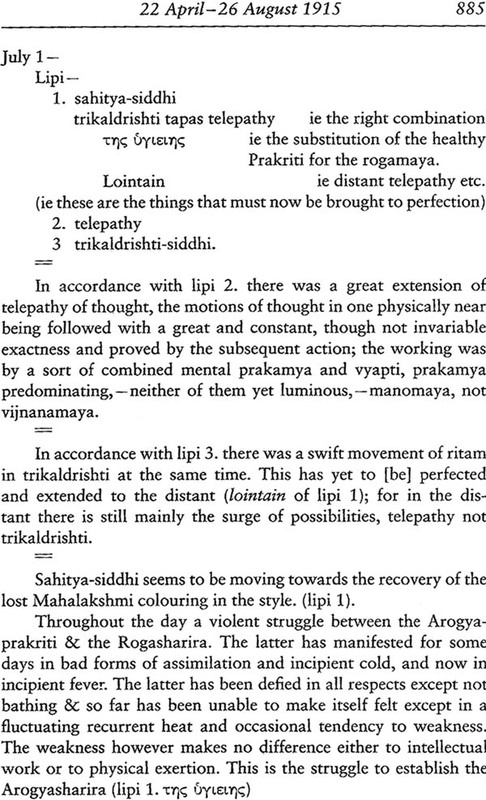 Its perfection is God's stamp and seal on the siddhi of the samata. It is in our internal being the image of the smile of Srikrishna playing, bdlavat, as the eternal balaka and kumara in the garden of the world. Recorded of yoga is a diary of Sri Auobindo ‘s practice yoga between 1909 and 1927. 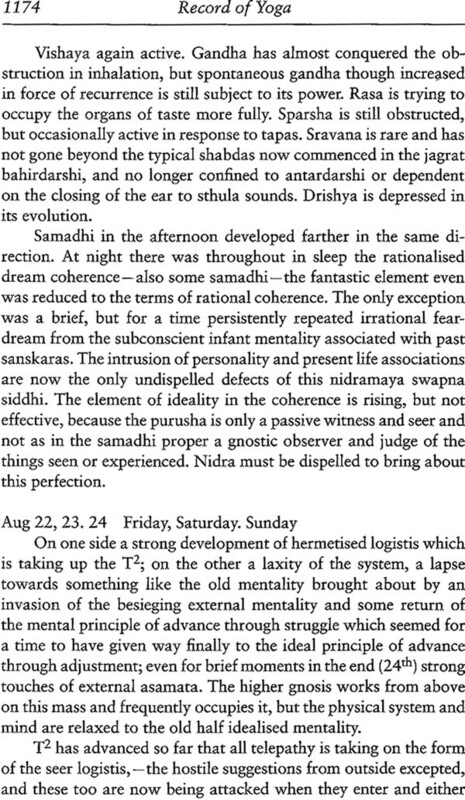 “doubt is being destroyed by the growth of the ideality samata and dasya perfected have got rid of egoistic desire and its attendant stains , the Ishwara is governing the being; therefore the time has come t establish the inner joy and light , in itself entirely , the joy of thing being merely its out flowing & not at all dependent on things. With this will come the completion of the brahmabhava by the dissolutions of the remnant s of mentality & the power to begin the Karma.